Anthony Joshua - Dare We Dream Of A David Haye Fight? On last night’s ‘Rule Britannia’ show from London – in which the British world title challengers enjoyed mixed fortunes – gold medal winning Olympian Anthony Joshua (13-0 , 13ko) absolutely destroyed American challenger Kevin Johnson inside 2 rounds to send shock-waves up the rankings and further put the division on notice regarding his arrival as a serious player. Johnson – who had been sold as having never been stopped – was expected to give Joshua at least a few rounds, promising he would deliver and be the Brit fighters biggest test to date. And on paper – he was. 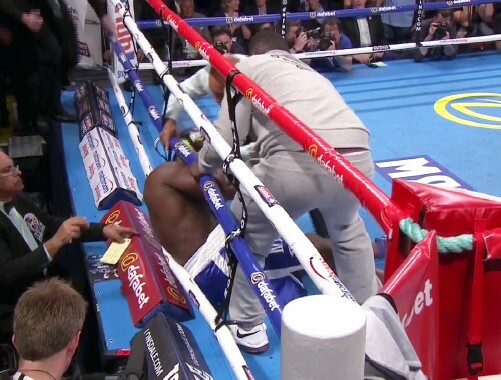 Despite having lost 4 of his last 5 going in, much was made of his durability – and it’s true he had extended both Tyson Fury and Dereck Chisora the 12 round distance – yet as soon as he tasted the Watford man’s power last night – we knew it was going to be a short fight. To be fair, it’s amazing Johnson even got out of the first round given the rollocking he took – and I wasn’t surprised to hear him announce after the fight that he intends to retire. As for Joshua – what do they do with him now? Already ahead of last night he had his next fight penciled in – against a TBA opponent on the big July 18th Matchroom Show – which will likely be the next PPV – yet in ring post fight last night, Eddie Hearn promised it will be September 12th that “a big name opponent” will be lined up for him. I don’t know why but something tells me Hearn would love a massive showdown with David Haye – and so would the fans. The Hayemaker has been constantly telling anybody who will listen that he intends to make a ring return this year – and given the magnitude of a potential Joshua fight – and the money involved – I genuinely believe he could be tempted out of retirement. There will of course be those who would say such a fight is far too soon, that Haye is too ring savvy, smart and powerful for Joshua – but his advancing years and smaller size, coupled with his inactivity – all make for a far more level playing field for me. After the fight, all parties appeared to acknowledge that the time has come for the ‘L’ plates to come off – and for even more credible and stern tests to be presented. Against fighters with winning records, that’s for sure. And even if Haye is unrealistic in the eyes s of many, I believe a big Commonwealth title showdown with Australia’s undefeated champion Lucas Browne would be an absolute cracker of a fight. Failing that – a massive domestic showdown with old amateur foe – Londoner – Dillian Whyte – would be massive here. It is a fight that has been simmering away under the radar now since Whyte returned from a 2 year exodus from the sport last November. We wait with anticipation the next step in the Anthony Joshua journey. Whatever that may be. You are here: Home / Boxing News / Anthony Joshua – Dare We Dream Of A David Haye Fight?